The Assembly and its French counterpart, L'Assemblée, tackle contentious issues of race head-on by inviting strangers with strong political views to debate them around the dinner table. Imagine the most awkward dinner party possible. That's not exactly what playwright Annabel Soutar set out to create, but she did want to challenge the four strangers invited to share a meal. She, along with her colleagues Alex Ivanovici and Brett Watson, found four people on opposite ends of the political spectrum, then asked them to dinner. They did this twice: once with French-speaking Quebecers and once with Montreal anglophones. Then they used the transcriptions from those gatherings to make two distinct plays: The Assembly, in English and L'Assemblée, in French. Both shows are tense, challenging and funny. "This is a very concerted effort to say, 'Hey, guys, let's get into the same space' ... and watch people around the table have a really awkward, conflict-soaked conversation," Soutar said. "At least we're exposing ourselves to another point of view." She said a wide range of issues were discussed, but there is a noticeable difference in the content of the two plays. The English-language play delves into identity politics, whereas the French play discusses preserving the Quebec identity. Her inspiration for the play came from the 2016 American presidential election. She wanted to take aim at an increasingly polarized society, by forcing people out of their silos and making them interact with people who challenge their beliefs. "We're finding ourselves in professional, cultural bubbles where we're only exposed to the one point of view," she said. "We're not innovating in our political thinking." 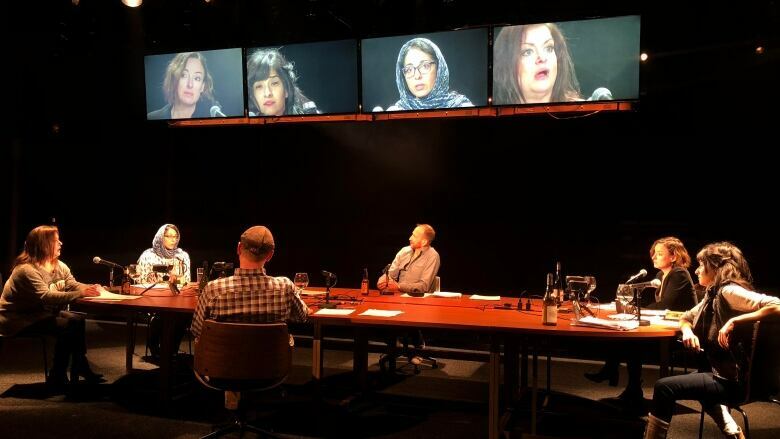 "The fact that public discourse itself seemed to be threatened made public discourse the subject of the show," said Ivanovici, Soutar's creative partner and an actor in the show. Soutar has built a career on documentary plays, drawing on real-life source material. Her previous work includes Fredy, a play that re-examines the police death of Quebec teenager Fredy Villanueva. She said she made an agreement with the dinner participants to use their actual words as the script. The French play debuts on Nov. 13, and its English counterpart launches on Nov. 10. Both are at Montreal's Espace Go, at 4890 St-Laurent Boulevard.